One of the things I’ve really enjoyed about the project so far is the way different people use the same material. I’m working on finishing up the next novella in the series, A Cavern Ripe With Dreams. I think I’ve mentioned it before; it’s heavily influenced by H.P. Lovecraft’s “Dreams in the Witch House,” William S. Burroughs’ Junky, and Joe Lansdale’s The Drive-in Chronicles. Here’s the teaser from the beginning of it, which went out with Nirvana Gates. An early memory. Was it his earliest memory or simply the earliest thing he remembered remembering? He wasn’t sure. One morning his father woke him from a nightmare. He was still young, perhaps eight. His father squatted on his heels besides Bill’s bedroll and shook his shoulder. When he woke, shuddering and gasping from dreams of strangle-fingered demons, feeling his breath still in jeopardy, his father didn’t say anything, just beckoned to him. He followed at his father’s heels, towards the world and the great tube that the city clung to. At the end of each tunnel the space widened considerably, leaving places where shelves and ladders and catwalks could be stretched. And beyond them all you could see the abyss itself, stretching downward and upward into darkness. The air was full of tiny, floating things. He stretched out his palm and kept it motionless long enough that one drifted to be trapped in his palm. A seed, a brown seed, and attached to one end a tuft of hairs, fine and feathery, carrying it along. Carefully he raised his hand, examined it more closely. The seed was so small, but ridges and swirls marked its surface and up close, it was no longer brown, but shades and gray and green and red that somehow blended together to create the impression of brown from just a few inches farther away. He closed his fingers around it, meaning to keep it, but it was so small that it wafted away even as his fingers moved. He’d only seen things fall into the abyss. But these, so light, sometimes moved upward or downward, sometimes tugged sideways as though snatched by invisible hands. Thousands and thousands of these, swirling through the air. He and his father gathered a painstaking handful, picking them from crevices. Other people were doing the same. How often did you get something like that without cost, like a gift from the universe? They picked up seeds, but they also stood for hours, watching it. Almost everyone in the city came to see it, even if their children had to carry them. People did not speak much, simply watched, as though storing it up. He grew bored and watched their faces. None of them looked at him. Even the other children seemed too self-absorbed to return his gaze, to notice that he was watching them. His mother arrived and paid them little attention, instead going to speak to the city council and offer her opinion of the event. Bill and his father stayed where they were and paid her no mind. At last he saw the cloud beginning to thin and his father stirred. “You may never see another thing like that,” he said, regretfully. “Some people live lifetimes between Openings. Others see dozens, maybe more. You never know.” He took Bill for breakfast from a vendor, bitter tea and roasted bulbs that tasted of smoke. As they ate, fewer and fewer of the seeds fell but there were still some, hanging in the air. He slept dreamlessly that night. When he went to the edge again, the seeds were gone and the air was blank. Not a trace of them remained, even the tiniest fragment had been taken. For the next year everyone tried to grow the seeds into plants. They tried different levels of moisture, or heat, or light from the sunstrip, but nothing worked and the seeds remained inert. He wondered what they would have produced. He wondered how they had come here. What decided when the world would open up and take something in? What lay outside the closed opening? What decided when it would open and close? It implied some sort of conscious force, he thought, but then again there were random things in the world, things that developed without purpose. What was Bill’s purpose? Did he have one? 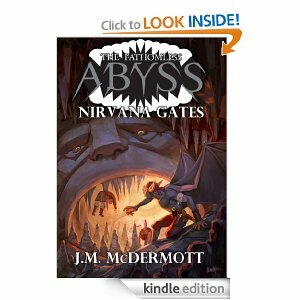 This entry was posted in publications, Writing and tagged a cavern ripe with dreams, fathomless abyss, j. m. mcdermott, nirvana gates. Bookmark the permalink.